Hello! I'm Courtney Tellefsen and I am the Founder and CEO of The Produce Box. 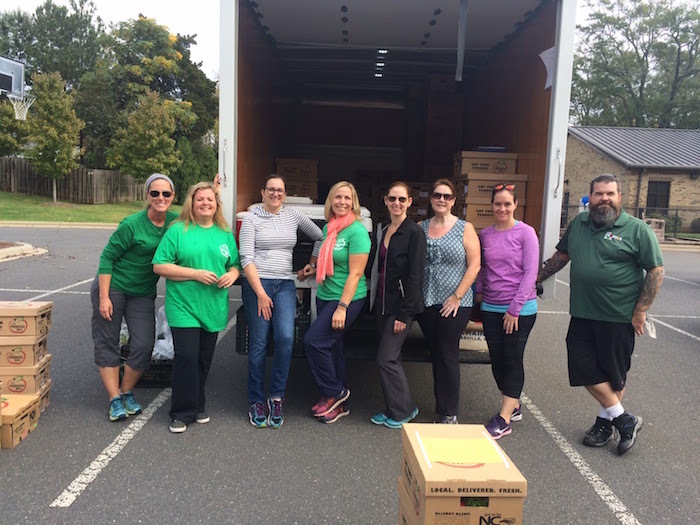 Here at The Produce Box, an army of 300 stay-at-home moms and dads hand-deliver fresh, local produce to the doorsteps of families all throughout North Carolina. We're awfully proud that our members purchase 2 million pounds of produce every year and support more than 70 local farmers. I started this company because I was curious about my own food. I found myself wondering where it was coming from and if I was supporting local North Carolina farmers with my purchases. Fast forward a few years and now you have The Produce Box, which is thriving. My typical day is spent meeting with my team on all facets of the business: marketing, accounting, customer service and operations. On Fridays I dedicate time to work on our weekly menu, offering up the best curated box combinations of delicious fruits and veggies for our members. 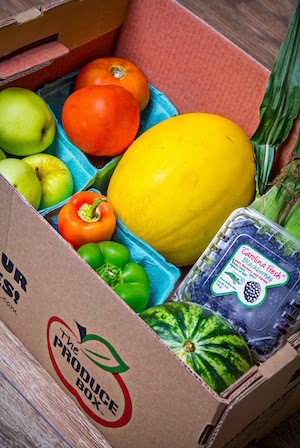 I have several direct-reports, and our business model has a LOT of moving parts with more than 6000 produce box deliveries happening all over the state each week. Due to all of the logistics we're dealing with, email ends up being a substantial sum of our communication. It was important for us to find the right platform to handle because one thing a young company doesn't want to worry about is the reliability of their email platform. We've found Google Apps to be a great all-in-one solution for emailing and scheduling. As a Google Apps customer we've found a way to make the moving parts of our business more manageable with the simple and easy to use platform. I love how everything - email, calendars, docs - communicates together and I find each system well designed and easy to use. Even the best email client has limitations, and with my company growing, it wasn't long before I needed just a little bit more. My inbox was growing steadily, and it wasn't unheard of for Emails to get "lost" in the sea of correspondence. Because my business and my company relies on email, any "lost" messages can have a detrimental impact. I was also discovering that there are certain business related tasks that happen at certain times of the year. It can be really difficult to keep track of these things year to year which pushed me towards searching for some way to help make future Courtney's life a little easier. Who knows what could be on her plate a year from now. I'm always on the lookout for new tools I can use to make me work smarter. When I heard about Boomerang from a blog post that mentioned it as a great productivity tool, I gave it a try and I've been hooked ever since! Boomerang seemed to have a solution for all of the small pain points I'd been experiencing and on top of that, it makes me appear like a magical genius to my employees and sometimes even to myself. From the get go, I appreciated how Boomerang didn't force me to change my workflow or make me move to another platform. I was still able to do everything I was used to, just with more power - like a super boost for my email. A couple key features that stood out right away were Boomerang's snooze and send later. Often, I don't have time to address an email right at the moment I read it. Now I will just click the Boomerang button and schedule it back to myself for two hours from now, or for a time when I know I can provide my full attention. I no longer have to worry about messages getting forgotten because I know they'll come back to the top of my inbox when I can handle them. I also want to make sure I'm respecting my employees and the work/life balance they have set up. I like to work early in the morning (sometimes as early as 5:30am!) and for me that's usually a good time to send emails. Most employees would tell you that they would rather not receive emails - especially from their boss - at 5:30am before they're online. With Boomerang's Send Later feature, I set them to send later in the morning so I don't freak out my employees when they start their day with 2-3 emails from me first thing. With this simple feature, I'm able to get my email done at a time that works for me and still set the right expectations for my team. As I mentioned previously, we have various business related tasks or events that happen at different times of the year. I want to remind myself of these things at the same time next year so I'm not left frantically trying to search for an important document or remember exactly what I was supposed to do. I use Boomerang to send myself a reminder the following year so I don't have to worry about it and I'll be reminded exactly when it's time to start thinking about that task again. Sounds crazy but when that time rolls around the next year, I amaze myself that I had the forethought to do it in the first place! Haha! I love how Boomerang just fits whatever need we might have. It's almost like the extension flexes with my needs. Sometimes, there is a new positive habit I am trying to instill. Other times, there might be a completely new system or process that my team is integrating that requires a weekly responsibility. For these, I use the recurring email feature to "remind us all" of what we need to do. It's so easy to set up and customize right through the Send Later menu. Sometimes I use this feature just to remind myself of who I should check in with or which deliverables I'm expecting on a regular basis. It allows us to be flexible and try new things while maintaining accountability across the entire team. For me personally, using Boomerang with our Google Apps accounts has helped take the focus away from email and helped me to spend more time focusing on other fruitful parts of the business while still ensuring I stay on the ball and never forget those important details that flood into my email. Boomerang has been and continues to be hugely helpful in managing my constantly swelling inbox (over 100 emails a day!). I love it! "I use the Boomerang feature and send myself something the following year. Sounds crazy but when that time rolls around, I amaze myself that I had the forethought to do it in the first place!" "Boomerang has been hugely helpful in managing my inbox (over 100 emails a day!) I love it!"